No one warned me that Seattle was a foodie’s dream come true. So I suppose that’s why I was so surprised when I over-stuffed myself while in the city. It’s funny, too, because I usually eat quite a bit when I’m in Paris (if you have to ask why, you need to go there and see for yourself), but I ate even more while in Seattle. Who knew? There is some amazingly great fresh food in the Emerald City. I will admit that my first breakfast was room service because I was running late and needed to get into a costume for GeekGirlCon. I had a fresh croissant with bacon, egg and cheese, along with a local juice. Usually, room service isn’t much to get excited about. But this was really good. The hotel where I stayed, the Hotel Max, was renovating their in-house restaurant and was working with a local organic market for room service. Because that’s how Seattle is. There’s no frozen or pre-prepared crap anywhere. So dressed as Rose Tyler from Doctor Who, I attended the con on Saturday. You can read about my wonderful experience here. This was one of the best cons I’ve ever been to, and I hope to go again next year. There was a little something for everyone and I found the panels to be the most interesting and thoughtful of any con I have attended. I also ate well during the con, which has to be a first. Most people starve themselves through cons because getting any sort of decent food is generally impossible. Well, the building where the GeekGirlCon was hosted at has a bakery/cafe called Wild Rye that is excellent. My first lunch there was a roast beef sandwich. The bread was fresh and the horseradish sauce was divine. After a full day of con panels, though, it was time to eat again – this time, for dinner. I decided to change out of costume and walk to BlueAcre Seafood. Mostly because it was close and it was there and it was seafood. I got in without a reservation and sat at the bar, where I had a lovely local Riesling. 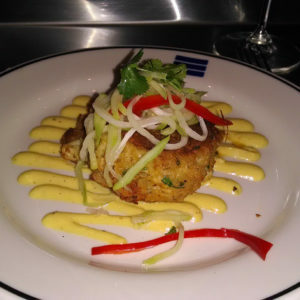 And I ordered a crab cake, because that’s one of my favorite seafood things. It was good. The dessert I had after it was also wonderful. 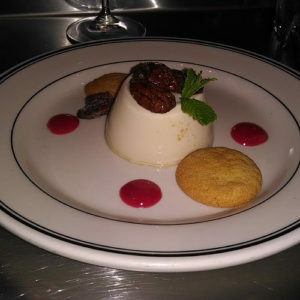 It was a maple syrup panna cotta. Then I returned to the con and watched an absolutely hilarious Star Trek improv. It was a very good evening. Sunday went just as well. My costume for the day was Emma Swan from Once Upon A Time. I’d planned that deliberately as I had an interview with one of the show’s writers (and the best writer on television, I might add) Jane Espenson later that day. I decided to go out for breakfast that morning, though, and discovered Top Pot doughnuts. OMG, GOOD!!! 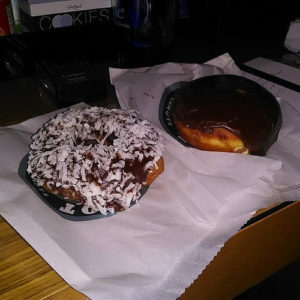 I had the chocolate coconut and a Boston creme. I started my morning hyped up on sugar! It was a good thing, too, because I didn’t eat anything until after my interview with Espenson. I was so nervous that I needed that sugar running through my system. However, the interview went well, dare I say great? This was literally my first one-on-one face-to-face interview. And it was with one of my writing heroes. It was AWESOME! I realized after the fact that all of my questions were writing-based, too. I especially liked her answer about writing villains. Be looking for that piece over at FanGirlConfessions.com in the next week or so. I returned to Wild Rye for lunch. I had a half of a wonderful chunky chicken salad sandwich, along with a great chowder. This was definitely the best eating I’ve ever done at a con. I completed the day’s activities with a “Ladies of the 80’s Sing-A-Long” (you have not lived until you’ve been in a room full of people singing “Total Eclipse of the Heart”) and the con closing ceremonies, which was a live performance of a wonderful song called “Nothing To Prove” by The Doubleclicks. GeekGirlCon proved to be a wonderful experience. That evening, a met up with an old friend, Krissie, who took me out to a place called Lunchbox Laboratory. I drank alcohol from beakers (how cool is that?) and had the best burger I’ve had in a long time. The drinks, though, were YUM! I ended up with a Root Beer Barrels drink that literally tasted like root beer (but with booze) and a Snapplicious that was Snapple (with booze). The french fries were also good. I know this because I didn’t eat them with ketchup like I normally do when french fries are just okay or mediocre. So those were my first two days in Seattle. Stay tuned for more.